The Americans have voiced fears over the prospect of a Tory government, warning that a "self-absorbed" govt. would be "a more tentative and less reliable" ally. William Hague, in an interview in today’s Financial Times, tries to build bridges with Europe, insisting a Tory government wouldn’t “pick a fight” with Europe if it won the election, and would be “highly active and activist in European affairs from day one”. With Britain’s fiscal crisis “a priority”, says Hague, “we have enough on our hands without an instant confrontation with the EU”. His “EU olive branch”, as the FT puts it, comes as The Guardian reports Nicolas Sarkozy’s warning to the Conservatives over defence co-operation in Europe. The French president’s ire follows news the Tories plan to pull out of the European Defence Agency if elected. 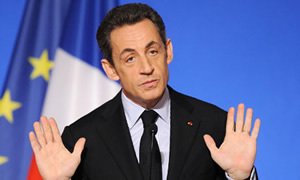 M Sarkozy, who is due to meet David Cameron on Friday, will tell him that the Tories’ stance “risks forfeiting vital French co-operation on energy, defence and the economy” if a future Conservative government refuses to engage over the future of Europe. The Americans have also voiced fears over the prospect of a hostile, Eurosceptic Tory government, with the National Journal reporting concern in Washington that a “self-absorbed” Tory government would be “a more tentative and less reliable” ally. Yesterday, Left Foot Forward reported a joint attack on the Conservative party’s European policies from foreign secretary David Miliband and Lib Dem foreign affairs spokesman Ed Davey, Miliband speaking of how “profoundly wrong” Hague “sees British influence being exercised, not just in Europe, but around the world”. So does that mean according Hague that once the fiscal crisis is over then from a Tory perspective a confrontation with Europe is inevitable. Good to see where he is coming from. Look out Shamik; I smell another Tory U-turn. So, what happened to the power clawback idea?